Jerry is quite a character, obviously. You can read more by ordering his book here at Amazon. It was easy back then (late 70s/early 80s) to use stolen credit cards, because there was no swiper machine or computers. This was one of their biggest scams it appears. The clerk ran carbons of the card, the old fashioned way. On big ticket items like jewelry, they may call the credit company, but if the stolen card was fresh and not yet reported, it was all clear to buy stuff with. 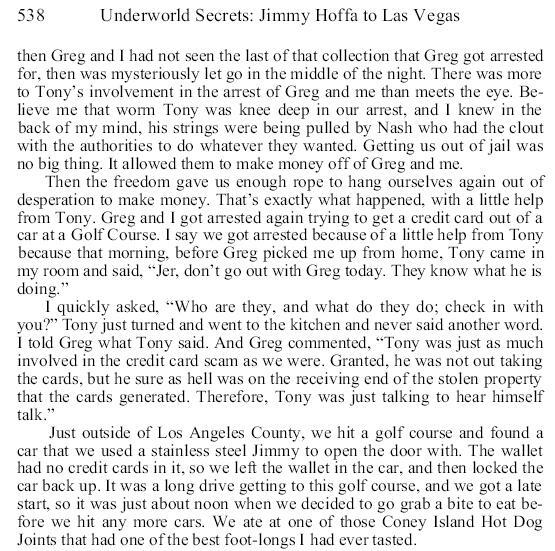 Again, Greg is Jerry’s friend (it’s not Greg Diles) and Tony is Nash underling, Anthony Mudarris. 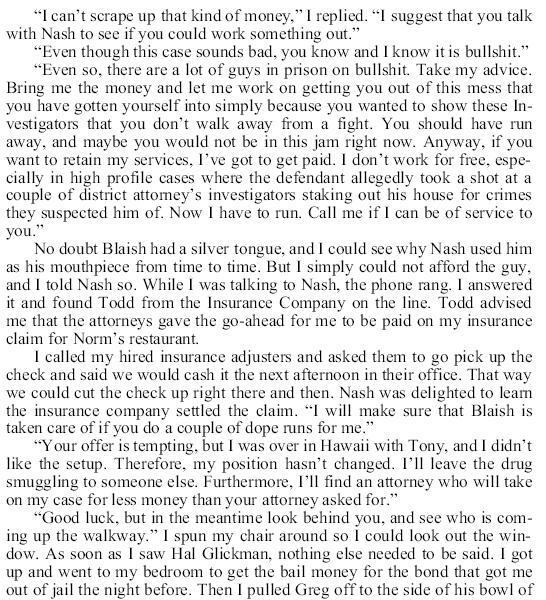 The Nash attorney, Mr. Blaish, is still around LA doing business… from a few Google searches. In the following scene, Jerry and Greg had been nailed at a mall using stolen credit cards to buy a watch. They tried to make a run for it but were caught, since they were both out of shape. Jerry was also in trouble at this time because he had been arrested for firing a gun in the air or towards D.A. investigators who had been watching him. Famous bail bondsman, Hal Glickman, also makes a cameo. Hal is deceased (about 10 years I believe). His wife, Dottie, who allegedly picked up Holmes that night, died of breast cancer on New Year’s Eve in 1997. Their son, who later took over the family bail biz, has not yet responded to my emails and FB messages requesting an interview. In the end, in my opinion, Nash had money and connections, he could even order a hit if he wanted. But he was really just a wealthy coke-head, pulling extracurricular scams, arsons and frauds for quick cash. He chased women day and night. To me, Nash was a slick wiseguy who used others to insulate himself from the crimes. Pure Nash. To those of you who think you are strange, I must also be! I find true crime interesting. I read up on different cases and this is one I have read into some about the dynamics of persons involved. Crazy how different they were yet drugs brought them all together. I have heard before that if you do drugs or get into the drug culture you will find others who are on the same track. Only the picture on the far right is David Clay Lind I should know he is my dad.I was looking for pictures of him too and can not find any youg ones but I saw him from ’92 to 94 . Thanks for visiting the blog. I am John. I am writing a book about the Wonderland Murders. I would like to interview you sometime about your dad. Very little is known about him. I have only found what little I know about him thru background checks, and they can be erroneous sometimes. Problems with this type of police work is the perps are really the victims and it’s really impossible for them to ever escape the system. The snitches that they turn out eventually are disenchanted, too, but for them it’s all too late. If you’re really one of Lind’s daughters, you should remember a couple of his Sacramento friends. Brad, maybe? Thanks Anon. I am writing a chapter for the book about the use of police informants in the 1970s. It was a different era, and like vice cops today, informants and snitches were an important part of their investigation, however sketchy… legally… those tactics are…. Were you visiting in Santa Rosa? Lee Meriwether was beyond hot! Ms. Meriwether is still hot. I believe they call that ‘prunetang’.